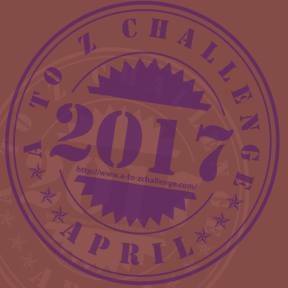 Lloyd of Gamebooks: What would happen if fighting Fantasy went from 2d6 to 1d12? What would happen if fighting Fantasy went from 2d6 to 1d12? 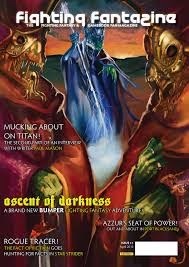 First of all, go and back The Frankenstein Wars, an awesome gamebook app with Paul Gresty, Dave Morris and Cubus Games. It costs a mere 4 euros (or £2.85) to get the app! Do that first! 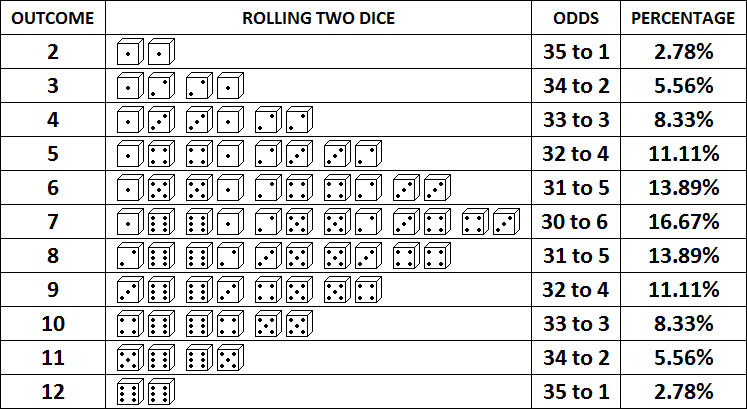 Ages ago, I wrote a post about using dice and what the probability of rolling a particular number on 2d6 was as well as the probability of winning an attack round depending on the difference in your skill and your opponent's skill. (at one point, I'm going to revisit my big posts to update them with my new knowledge, make them clearer and more pithy). We all know that some Fighting Fantasy books involve impossible die rolls. However, maybe if 2d6 was changed to 1d12, would that change things? Just in case you don't know, different numbers in 2d6 have a different probability due to the different number of combinations that produce different numbers. There are 6 ways to get a 7 with two dice, but only 1 way to get a 2 . This produces a 'bell curve' where it is easier to get numbers in the middle and less likely to get very large or very small numbers. This produces some interesting results, especially when you realise that increasing your skill by 1 point does not increase the probability of success by the same amount depending on what value your skill was to start with. Going from 6 to 7 increases the chance of success by 16.67%. Going from 9 to 10 increases the chance of success by half that - 8.3%. I then went to look at the probability of winning an attack round depending on the difference between your skill and your opponent's skill. So if your skill is 3 or more lower than your opponent's, then you're pretty much stuffed. So, how would things be different if we replaced 2d6 with 1d12? Well, for a start, there would be a higher chance of rolling a 1 (:P), but what about success in a test for skill? Or the chance to hit someone in combat? 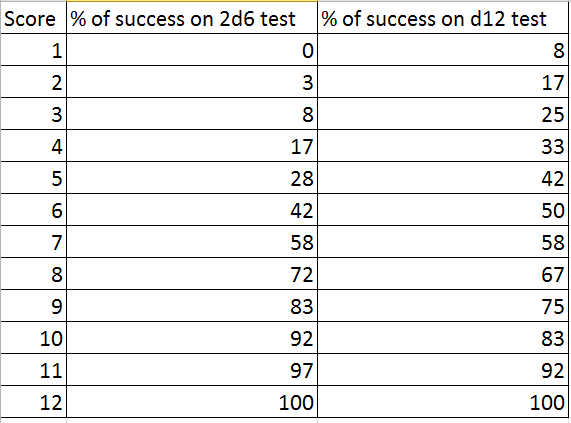 Unlike 2d6, increasing a score with a 1d12 system increases your chance of success by the same amount. Increasing your stat by 1 increases your chance of success by 8.3% whether its from 1 to 2 or 11 to 12. The graph below shows the probability of rolling at least a certain number from www.anydice.com. The 1d12 probability is a line, indicating that the probability changes by a consistent amount. The 2d6 probability is a curve, indicating that it changes by different amounts. Rolling a 7 or less has the same chance on both rolls. With 1d12 it is more likely to get extreme numbers (1 or 12) on 1d12. So having a low score is more forgiving with 1d12, but then after 7, having a high score has less benefit, making both a great failure and a great success less likely. What about winning a combat round? 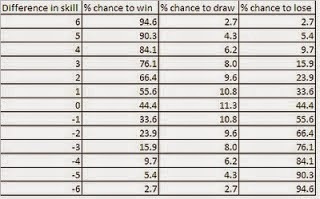 Compared to 2d6, the probability of winning when your skills are equal or there is a difference of 1 between you is very similar. 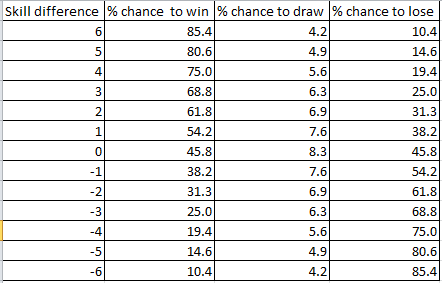 Once the difference gets bigger, the chance of winning or losing the round does not change by as much as with 2d6. There is a 25% chance to win an attack round against someone whose skill is 3 higher than yours (compared to 15% with 2d6), so once again, the middle values have similar amounts, but once you get very large or very small numbers, the changes are not so extreme - having a lower value is not as bad, but having a high value is not as good. So would using 1d12 make Fighting Fantasy easier? Considering a lot of the books have enemies with skills that are too high, yes. It will give a character with a lower skill a fighting chance. It would also make the books better for characters with higher skills as it will make combat less one sided and give them a chance of losing out. My beef with the combat in every gamebook I've played is that there are no decisions and it takes way too long. Drinking a potion to prevent death isn't a decision, it's a gimme. Even DestinyQuest has virtually no actual decisions in combat, and every combat lasts dozens of rolls. Even my nephew, who is more easily amused, got bored quick, and we went to automatically winning combat, which ruins the excitement of getting/choosing new equipment later. The lack of options is a problem. Way of the Tiger! and Blood Sword has a lot of options, but I guess if you can't think of options for combat, it's probably best to just make them short. Dice-based combat in gamebooks has always bored me. When I first started playing FF in the mid 1980s I couldn't believe you had to keep rolling dice over and over again, and quickly decided not to bother. After reading your comments, I'm going to change my Wayfarer rules so that combat is 1 roll, rather than a series of rolls to succeed. Thank you for the probability lesson maybe i will change the combat system of the site ffgamebooks-online.com to complate this, in the future. Many thanks for spotting that! I'll drop on by! You Are Our AFF Hero!!!!!! Me and my brothers account will be called "Ruffnut and Lorian"